When you play a game of thrones, you win or you die.. The next meme in the series is three wishes for Second Life. I probably could list more than three but these are the most important to me. 1. I wish there were less or no out of character drama in roleplay sims. It’s always unavoidable no matter what genre you are roleplay. Someone will spoil the fun for others with some sort of drama. Sometimes the drama can split up a group or close a sim. Drama is everywhere in life and in Second Life but I wish that it simply did not exist in my roleplay! 2. I wish that my inventory would automatically sort itself. These are wishes right? This would be ah-maz-ing! I would love to open my inventory and find it sorted in just the way I would like. 3. I wish that I could create things. I have tried and failed. When I first started playing Second Life, I made pajamas. I tried creating costumes from She-Ra a few times. I am no good at creating things. Maybe someday? What sort of Game of Thrones character would you play? I think I would definitely enjoy playing a small folk of some kind. I like some of the more mystical elements of Game of Thrones. The scenes with the followers of the Lord of Light are really getting interesting this season! Every now and again, it feels so good to let those silks slip to floor and put on something more playful! Unfortunately I missed this goldfish edition of the Nereida when it came out. But because Evangeline Miles loves us soooo much, she’s doing a limited time re-release of some of her special edition items! And at rock bottom prices, who could pass that up! But they are only available at the Fashion For Life Fair. So you gotta get your buns in motion and get them before they disappear to the dark (and probably wicked huge) recesses of Evie’s inventory! And don’t forget to grab a gander at her special RFL edition items. Some things to remember at fair: 1) EVERYONE has a tough time getting in. So patience is a must. By the same token, don’t afk in there. There’s tons of people trying to get in and support a great cause! 2.) Help lag!! Deprim as much as possible. I can’t tell you how many five mile wide pooftastic gowns I saw on people. Even poofers! It’s a sim killer folks. No one will care if you’re wearing system clothes with system feet and a bald hairbase. They’ll just be happy they can walk around you. 3.) Let the spirit of charity move you. Take a moment to appreciate the beautiful job that the sponsors and creators of this fair have done, and take a moment to walk through the memorial area they have designed. It’s very touching. Now, a few more goodies to point out on this post! See this awesome orange hands? That’s a fab tattoo layer by the amazing Aikea Rieko of the.Plastik. It’s called the Demon Fades, and this one is in Blaze. Aikea has an amazing selection of 56 stunning colors that feature tinted hands and feet, PERFECT for all manner of fantasy themed avatars! I also want to point out the sweet little face tattoo also by Aikea, called the Demon Fades Faces in Gaiha. 24 different styles to choose from! That hair is another awesome new release from Asuka Martin (known for work under the Dernier Cri label). This one is called Amber and features adorable little mini pigtails in a low swept style. And last but not least, I wanted to feature another of the Apple May Design skins. I couldn’t be more impressed with how sweet these skins come across. The shading is beautful, I love the fact that the tummy is not overdone, and the face is just flawless. Soft lips, soft eyes, with a subtle blush and delicate eyebrows. The skin shown here is the Arabell skin in Deep Tan. I took this pic using the cute little clam mermaid bed by Kami-Hitoe. They specialize in Japanese and Mermaid themed items, and this particular bed contains four animated poses and the bed itself can be opened or closed with a click. Hope you enjoyed this stuff guys! Landmarks to follow! It’s no secret that I’m secretly enslaved to Evie’s Closet, or that I live under her floorboards in the silk section… And with that tiny revelation I bring you one of her newest creations, the Coppelia gown. Like everything else she makes, it’s completely stunning. Textures are to die for. Prims are perfectly rendered. Colors and shading are superb. And it was a perfect fit right out of the folder. With this Evangeline Miles, I ask you… Can you do no wrong woman!? The gown features a tie back corset with sweetheart neckline, nixed sleeves, satiny finished skirt with soft tulle overlays that really give the skirt some oomph. I think my favorite discovery about this gown was the play on patterns. Straight cut lines mixed with the nearly flower petal shaped overlays, then the swirl of the bra pieces that travel down into a pinstriped panel and sheer and solid bits with even a few polka dots thrown in. It’s what the term eye candy was made for. And they all compliment each other so wonderfully. Six colors to choose from (and aren’t you proud I didn’t pick black!!! ): Sea Note, Bitter Wine (pictured), Night Orchid, White Opal, Lilypad, and Rowan Fire. Each only L$600. There are also some sweet little capelets in matching colors available at the main store. The necklace you see here is the Pink Pomp Necklace by Ganked. The skin is one of the new bonus group join skins from Mynerva (effing great skins folks). The hair is Pure Beauty in brown by LOQ. Pose by Estetica! Done! In keeping with my desire to cover more fantasy/rp wear, I went a little elvish today. This look was cute, fun, and so easy to put together. Beginning with the stunning Melusine gown here that I have blogged in the past. You may not know this, but many of your favorite Evie’s Closet gowns are available in white/cream editions in the bridal section! This gown was stunning in white and I just had to pick it up. L$600 for the gown. The hair is the Snowflake Queen by Ploom and is a group-only gift. The ice crown is detachable and even comes with a version that snows on you. 🙂 The skin, ears, twig horns, and elf ears are part of a preview for Atomic’s new brand Illusory. The Frostbite winter set is only sold as a set folks and it won’t be sold off separately. The skin is in a fair skin tone that has the faintest blue tint around the eyes and lips. The twiggy antlers even have little bits of sculpted snow, and the elf ears are tinted to match the skin down to the bluish hue of the tips. $1500 for the set. I think we can expect to see great things from Illusory and I for one cannot wait! The pose you see here is one of the Project 365 from Long Awkward Pose. I have really been happy with many of the poses that I’ve seen from this collection. And if you’re a serious photographer in SL, you might wanna check them out. L$25 for the pose. Christmas Goodies from Evie’s Closet! This gorgeous winter fae set is a special from Evie’s Closet, available right now in the mainstore! This Christmas edition of the Lyric set is a perfect way to jazz up for the holidays. The wings are included, and there’s even a tiny edition for sale as well! You can get your choice for only L$80. And to top it all off, there’s a set of Christmas edition circlets nearby for free and a personal snowdrift for L$10 and a Christmas munch faery for L$50. Get yours today! Hair by Truth, Skin by Grixdale (formerly Tyranny). 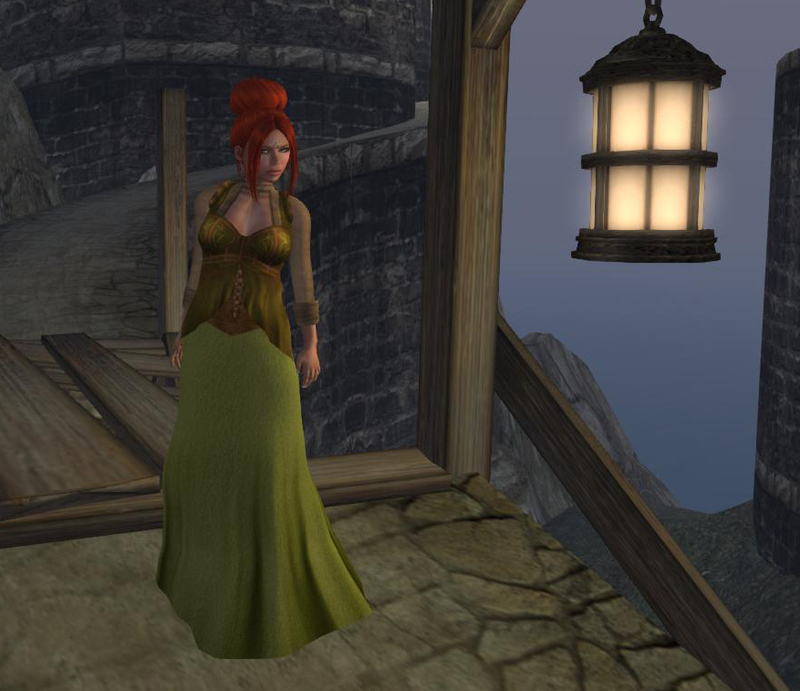 Evie’s grabs my attention yet again with this lovely tavern wench style gown. Included in each set is two types of sleeve, four styles of skirt, and clean and dirty versions of all pieces. As an added bonus, Evie gives us yet another style of skirt, sheer top, and dirty sleeve cap options! And it’s just in time for Halloween! Paired with some flowing hair and a pale skin, this set is hauntingly boo-tiful. 😀 (Cheesy. I know. But I couldn’t resist.) Five colors available: Purple, Brown, Red, Green, and Black (pictured)! L$750 per color set! Hair by LOQ, Skin by Dernier Cri, lashes by oBscene, Bird Skull Lapel Pin by RIPE (jewelry fair freebie), shape by Leafy, and background is Tomb DreamScene by Garden of Dreams! Well, I was feeling a bit on the ethereal side. So I dug through my ocean *ahem* inventory, particularly the infamous “To Blog” folder”, and found this billowing beauty of a gown: the Milli gown. Now, I truly believe that a picture is worth a thousand words in this case. This dress photoed so beautifully, I just couldn’t resist slapping on a set of whimsical wings and skipping around my DreamScene! 😀 The gown can be worn a few different ways, thanks to all the pieces included in the set. Included are glitch pants, glitch top, sculpted ribbon for the back in two attachment options, long and short skirts both with and without trains, and trimmed and untrimmed top options. The dress is like a chiffon dream, floating about the body so gracefully, which we can definitely attribute to the sheer overlay over a solid base skirt. I love the monochromatic polka-dot pattern and the fact that it doesn’t make a joke out of this gown, it just works. The front is a sweetheart top with empire waistline and a pretty little floral detail if you choose to wear it. This gown can be dressed up or down, depending on your choice of accessories. Colors to choose from include: Spearmint, Tea (pictured), Pink Pudding, Apple Sorbet, Wildberry Mousse, and Creamsicle! L$500 per color set! 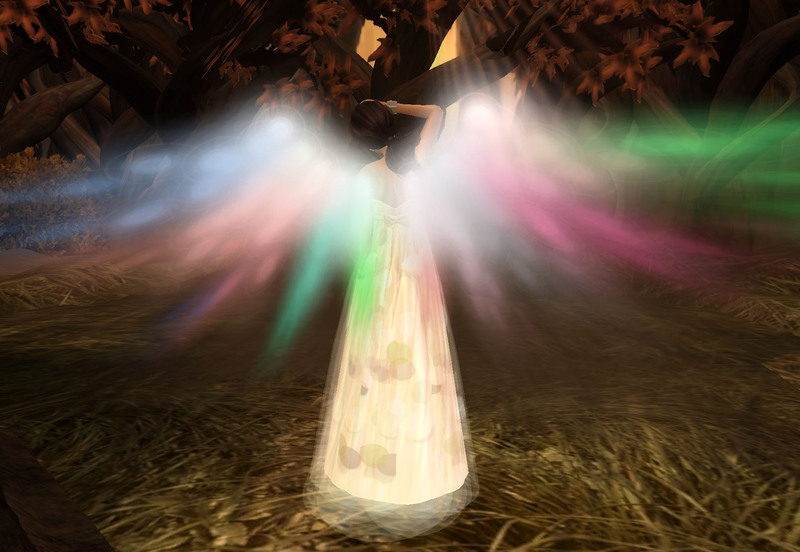 Now I found this wings in my inventory labeled Aurora Wings 2.0 and I’ll be darned if I couldn’t find a designer name ANYWHERE. So if someone knows where they came from speak up! Other credits include: skin by Atomic, Hair by Fri.day, lashes by LeeZu, DreamScene by Garden of Dreams, bracelets by YS&YS, and eyes by Celestial Studios!